As our Editor-In-Chief documented in an April post filled with comments I cannot read without tearing up, on March 22 I experienced an aortic dissection, a relatively rare injury in which the aortic wall splits, allowing blood to go where it shouldn’t. It’s caused by high blood pressure (which I am taking care of now), smoking (which I’ve quit) and genetics. It’s the same thing that killed my biological father 20 years ago. It could very well have killed me, but I still function. Complications from the event have left me paralyzed from the chest down, but I have an awesome electric wheelchair and have started financing a special ramp-equipped van. I like to pretend my transforming cog has been lost and I am stuck in vehicle mode. There are many reasons I am alive today. My family was extremely supportive through my months of treatment. My wife, Emily, is the strongest woman I’ve ever known, taking care of our twin seven year olds and me at the same time. My coworkers rallied for me time and time again, keeping my spirits up as I celebrated my 45th birthday in the intensive care unit at Kennestone Hospital, unable to eat solid food or even speak (I wish we could share the happy birthday video, it was glorious). And then there’s you, our readers. Your encouragement and well-wishes in comments and on Twitter filled me with joy during times I didn’t have much to be joyous about. Generous donations to the GoFundme set up by one of my wife’s friends allowed me to focus on recovery without worrying about Emily and the kids being able to eat and pay bills. You people are amazing, and I love you all. So, where were we? Hatsune Miku? 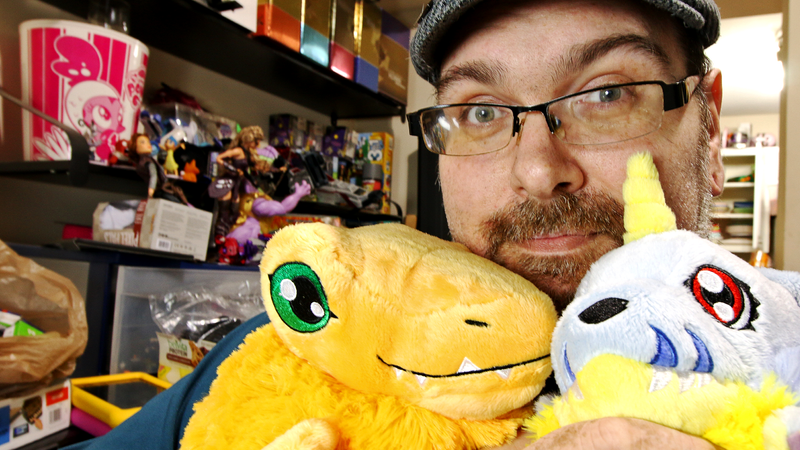 Digimon Plushies? What’s that, there’s a new World of Warcraft expansion coming out? Well then, it’s time to get to work.